The unveiling of the U.S. version of the Samsung Galaxy S II is just around the corner, yet somehow an official press shot of the devices in question managed to make its way onto the world wide web. 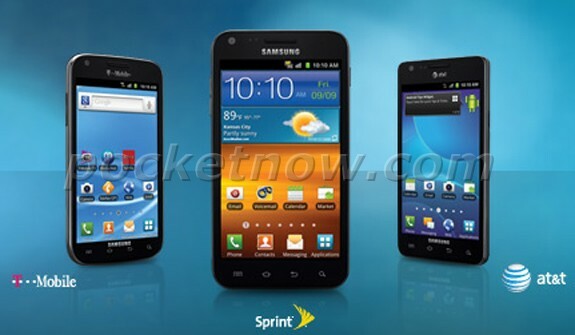 Today, we can show you with the utmost certainty the trio of Samsung Galaxy S II droids destined for the U.S. that will no doubt make a splash across the Atlantic when they do arrive. As you can see from the picture, these power droids will be launched on the Sprint Wireless, AT&T, and T-Mobile networks respectively. These being the largest networks in the U.S. - Verizon Wireless is missing from the picture. The U.S. Galaxy S II differs from its rest-of-the-world sibling by its lack of home button at the front. Instead, you get four touch sensitive buttons, a la Samsung Infuse 4G. The edges of the T-Mobile and Sprint versions are also rounder than the ones of the Galaxy S II which we know so well. We will know more about these droids when we attend the launch event in New York City (by the way, it has been postponed by a day due to inclement weather), so expect to get the full scoop on the three devices this coming Tuesday. In the meantime, tell us which one you like the most in the comments section below.